This article is about the 1997 Italian film. For other uses, see Life Is Beautiful (disambiguation). "La vita è bella" redirects here. For other uses, see La vita è bella (disambiguation). In 1939 in the Kingdom of Italy, Guido Orefice is a young Jewish man who arrives to work in the city where his uncle Eliseo operates a restaurant. Guido is comical and sharp, and falls in love with a girl named Dora. Later, he sees her again in the city where she is a teacher and set to be engaged to a rich but arrogant man, a local government official with whom Guido has regular run-ins. Guido sets up many "coincidental" incidents to show his interest in Dora. Finally Dora sees Guido's affection and promise and gives in against her better judgement. He steals her from her engagement party on a horse, humiliating her fiancé and mother. They are later married and have a son, Giosuè, and own a book store. When World War II breaks out, Guido, his uncle, and Giosuè are seized on Giosuè's birthday. They and many other Jews are forced onto a train and taken to a concentration camp. After confronting a guard about her husband and son and being told there is no mistake, Dora volunteers to get on the train in order to be close to her family. However, as men and women are separated in the camp, Dora and Guido never see each other during the internment. Guido pulls off stunts, such as using the camp's loudspeaker to send messages—symbolic or literal—to Dora to assure her that he and their son are safe. Eliseo is executed in a gas chamber shortly after their arrival. Giosuè barely avoids being gassed himself as he hates to take baths and showers, and did not follow the other children when they had been ordered to enter the gas chambers. In the camp, Guido hides their true situation from his son. Guido explains to Giosuè that the camp is a complicated game in which he must perform the tasks Guido gives him. Each of the tasks will earn them points and whoever gets to one thousand points first will win a tank. He tells him that if he cries, complains that he wants his mother, or says that he is hungry, he will lose points, while quiet boys who hide from the camp guards earn extra points. Giosuè is at times reluctant to go along with the game, but Guido convinces him each time to continue. Guido maintains this story right until the end when, in the chaos of shutting down the camp as the Allied forces approach, he tells his son to stay in a box until everybody has left, this being the final competition before the tank is his. Guido goes to find Dora, but while he is out he is caught by a German soldier. An officer makes the decision to execute Guido, who is led off by the soldier. While he is walking to his death, Guido passes by Giosuè one last time, still in character and playing the game. He winks at Giosuè and Giosuè winks back as Guido is led away to be shot. The next morning, Giosuè emerges from the sweat-box, just as a U.S. Army unit led by a Sherman tank arrives and the camp is liberated. The prisoners travel to safety, accompanied by the Americans. Giosuè soon spots Dora in the procession leaving the camp and are reunited. Later, as a man, Giosuè realizes his father's story of sacrifice for his family. The film was shot in Arezzo, Tuscany, including by the Badia delle Sante Flora e Lucilla. Director Roberto Benigni, who wrote the screenplay with Vincenzo Cerami, was inspired by the story of Rubino Romeo Salmonì and his book In the End, I Beat Hitler, which incorporates elements of irony and black comedy. Salmoni was an Italian Jew who was deported to Auschwitz, survived and was reunited with his parents, but found his brothers were murdered. Benigni stated he wished to commemorate Salmoni as a man who wished to live in the right way. He also based the story on that of his father Luigi Benigni, who was a member of the Italian Army after Italy switched to the Allied side in 1943. Luigi Benigni spent two years in a Nazi labour camp, and to avoid scaring his children, told about his experiences humourously, finding this helped him cope. Roberto Benigni explained his philosophy, "to laugh and to cry comes from the same point of the soul, no? I'm a storyteller: the crux of the matter is to reach beauty, poetry, it doesn't matter if that is comedy or tragedy. They're the same if you reach the beauty." His friends advised against making the film, as he is a comedian and not Jewish, and the Holocaust was not of interest to his established audience. Because he is Gentile, Benigni consulted with the Center for Documentation of Contemporary Judaism, based in Milan, throughout production. Benigni incorporated historical inaccuracies in order to distinguish his story from the true Holocaust, which he said only documentaries interviewing survivors could provide "the truth" about. The film was shot in the centro storico (historic centre) of Arezzo, Tuscany. The scene where Benigni falls off of a bicycle and lands on Nicoletta Braschi was shot in front of Badia delle Sante Flora e Lucilla in Arezzo. In Italy, the film was released in 1997 by Cecchi Gori Distribuzione. The film was screened in the Cannes Film Festival in May 1998, where it was a late addition to the selection of films. In the U.S., it was released on 23 October 1998, by Miramax Films. In the U.K., it was released on 12 February 1999. The film was aired on the Italian television station RAI on 22 October 2001 and was viewed by 16 million people. This made it the most watched Italian film on Italian TV. 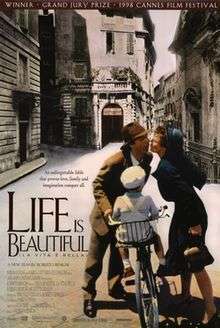 Life is Beautiful was commercially successful, making $48.7 million in Italy. It was the highest grossing Italian film in its native country until 2011, when surpassed by Checco Zalone's What a Beautiful Day. The film went on to gross $57,563,264 in North America and $171,600,000 in other territories, for a worldwide gross of $229,163,264. It was the highest grossing foreign language film in the United States until Crouching Tiger, Hidden Dragon (2000). Roberto Benigni received positive reviews for his film and performance, which he starred in with his wife Nicoletta Braschi. The film was praised by the Italian press, with Benigni treated as a "national hero." Pope John Paul II, who received a private screening with Benigni, placed it in his top five favourite films. Roger Ebert gave the film three and a half stars, stating, "At Cannes, it offended some left-wing critics with its use of humor in connection with the Holocaust. What may be most offensive to both wings is its sidestepping of politics in favor of simple human ingenuity. The film finds the right notes to negotiate its delicate subject matter." Michael O'Sullivan, writing for The Washington Post, called it "sad, funny and haunting." Janet Maslin wrote in The New York Times that the film took "a colossal amount of gall" but "because Mr. Benigni can be heart-rending without a trace of the maudlin, it works." The Los Angeles Times's Kenneth Turan noted the film had "some furious opposition" at Cannes, but said "what is surprising about this unlikely film is that it succeeds as well as it does. Its sentiment is inescapable, but genuine poignancy and pathos are also present, and an overarching sincerity is visible too." David Rooney of Variety said the film had "mixed results," with "surprising depth and poignancy" in Benigni's performance but "visually rather flat" camera work by Tonino Delli Colli. Owen Glieberman of Entertainment Weekly gave it a B−, calling it "undeniably some sort of feat — the first feel-good Holocaust weepie. It's been a long time coming." However, Glieberman stated the flaw is "As shot, it looks like a game." In 2002, BBC critic Tom Dawson wrote "the film is presumably intended as a tribute to the powers of imagination, innocence, and love in the most harrowing of circumstances," but "Benigni's sentimental fantasy diminishes the suffering of Holocaust victims." The film aggregator website Rotten Tomatoes gave the film a "Fresh" 80% rating. Life is Beautiful was shown at the 1998 Cannes Film Festival, and went on to win the Grand Prix. Upon receiving the award, Benigni kissed the feet of jury president Martin Scorsese. 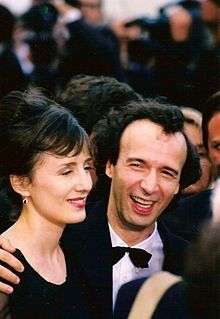 At the 71st Academy Awards, the film won awards for Best Music, Original Dramatic Score, and Best Foreign Language Film, with Benigni winning Best Actor for his role. Benigni's behaviour at the ceremony was regarded as memorable, as he jumped on top of the seats as he made his way to the stage to accept his first award, and upon accepting his second, said, "This is a terrible mistake because I used up all my English." The original score to the film was composed by Nicola Piovani, with the exception of a classical piece which figures prominently: the "Barcarolle" by Jacques Offenbach. The soundtrack album won the Academy Award for Best Original Dramatic Score and was nominated for a Grammy Award: "Best Instrumental Composition Written for a Motion Picture, Television or Other Visual Media", but lost to the score of A Bug's Life. ↑ "LA VITA E BELLA (LIFE IS BEAUTIFUL) (12A)". Buena Vista International. British Board of Film Classification. 26 November 1998. Retrieved 23 August 2013. ↑ "Box Office Information for Life is Beautiful". The Wrap. Retrieved 4 April 2013. 1 2 "Life is Beautiful". Box Office Mojo. Retrieved 11 September 2016. ↑ Squires, Nick (11 July 2011). "Life Is Beautiful Nazi death camp survivor dies aged 91". The Daily Telegraph. Retrieved 11 September 2016. ↑ Paradiso, Stefania (10 July 2011). "E' morto Romeo Salmonì: l'uomo che ispirò Benigni per La vita è bella". Un Mondo di Italiani. Retrieved 11 September 2016. ↑ Martin F. Norden, ed., The Changing Face of Evil in Film and Television, Rodopi, 2007, p. 146. ↑ Kerrie Piper, Life is Beautiful, Pascal Press, p. 12. 1 2 3 4 Logan, Brian (29 January 1999). "Does this man really think the Holocaust was a big joke?". The Guardian. Retrieved 11 September 2016. 1 2 Okwu, Michael (23 October 1998). "'Life Is Beautiful' through Roberto Benigni's eyes". CNN. Retrieved 11 September 2016. 1 2 3 Stone, Alan A. (1 April 1999). "Escape from Auschwitz". Boston Review. Retrieved 11 September 2016. ↑ Warkentin, Elizabeth (30 May 2016). "Life truly is beautiful in Tuscany's underappreciated Arezzo". The Globe and Mail. Retrieved 12 September 2016. 1 2 3 Rooney, David (3 January 1998). "Review: 'Life Is Beautiful'". Variety. Retrieved 12 September 2016. 1 2 Piper, p. 11. 1 2 Maslin, Janet (23 October 1998). "Giving a Human (and Humorous) Face to Rearing a Boy Under Fascism". The New York Times. Retrieved 11 September 2016. ↑ "Benigni, audience da record oltre 16 milioni di spettatori". La Repubblica. 23 October 2001. Retrieved 11 September 2016. ↑ Alisa Perren, Indie, Inc.: Miramax and the Transformation of Hollywood in the 1990s, University of Texas Press, 2012, p. 274. ↑ "Checco Zalone supera Benigni". tgcom24.mediaset.it. Retrieved 11 September 2016. ↑ "Foreign Language". Box Office Mojo. Retrieved 11 September 2016. ↑ Ebert, Roger (30 October 1998). "Life Is Beautiful". Rogerebert.com. Retrieved 11 September 2016. ↑ O'Sullivan, Michael (30 October 1998). "'Life's' Surprisingly Graceful Turn'". The Washington Post. Retrieved 11 September 2016. 1 2 Turan, Kenneth (23 October 1998). "The Improbable Success of 'Life Is Beautiful'". The Los Angeles Times. Retrieved 12 September 2016. ↑ Glieberman, Owen (6 November 1998). "Life Is Beautiful". Entertainment Weekly. Retrieved 12 September 2016. ↑ Dawson, Tom (6 June 2002). "La Vita è Bella (Life is Beautiful) (1998)". BBC. Retrieved 12 September 2016. ↑ "Life is Beautiful". Rotten Tomatoes. Retrieved 2010-12-28. 1 2 "Festival de Cannes: Life is Beautiful". festival-cannes.com. Retrieved 1 October 2009. 1 2 "The 71st Academy Awards (1999) Nominees and Winners". oscars.org. Retrieved 20 October 2015. ↑ Higgins, Bill (24 February 2012). "How 'Life Is Beautiful's' Roberto Benigni Stole the Oscars Show in 1999". The Hollywood Reporter. Retrieved 11 September 2016. ↑ "1999 Winners & Nominees". AACTA.org. Retrieved 11 September 2016. ↑ Lister, David (11 April 1999). "Good night at Baftas for anyone called Elizabeth". The Independent. Retrieved 11 September 2016. ↑ "César du Meilleur film étranger - César". AlloCiné. Retrieved 11 September 2016. ↑ Clinton, Paul (26 January 1999). "Broadcast Film critics name 'Saving Private Ryan' best film". CNN. Retrieved 11 September 2016. ↑ "La vita è bella - Premi vinti: 9". David di Donatello. Retrieved 11 September 2016. ↑ "European Film Awards Winners 1998". European Film Academy. Retrieved 11 September 2016. ↑ Madigan, Nick (7 March 1999). "SAG tells Benigni 'Life' is beautiful". Variety. Retrieved 11 September 2016.